Ducted gas heating is one of the most common heating systems in Victoria. It can be installed in a new home or added to an existing one, and is the perfect choice if you want to warm your entire home to a temperature of your choosing. A heating unit is connected to a series of outlets via a system of ducts. The outlets are then placed throughout the home, in the ceiling or floor. The unit itself can be installed in the ceiling cavity or under the floor depending on the design of your home. Ducted heating works by drawing air from the home through a return air grille. The air then flows through the heater where it is warmed, and then fanned gently through the rooms in the home. Once the temperature inside the home reaches your set temperature, the gas burners and fan will slowly come to a stop, making sure all of the heat in the ducts is used. At Dale Air, we can help you decide on the capacity and efficiency level of heating according to your needs. 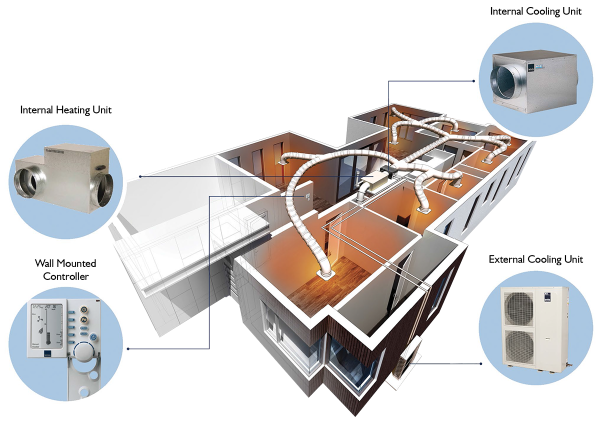 We specialise in high efficiency systems that can be zoned. Zoning your system allows you to isolate the areas of the home where heating is not required, and enables you to reduce energy consumption. A heating unit is connected to a series of outlets via a system of ducts in the floor or the ceiling. Ducted gas heating allows you to heat your entire home rather than just one room, setting the perfect level of comfort from one control panel. Ducted heating also means you don't have to walk out of a warm room into a cold one, as the warm air is evenly distributed throughout the home. Ducted heating systems are designed to provide a stream of high-quality air. These heaters do not produce dry air, and, as the central heating unit is normally placed outside the home, there are no fumes or smells inside. The air also passes through filters that trap large particles. Natural gas is considered one of the most energy efficient and environmentally-friendly fuels for heating. Ducted heating systems also come with efficiency ratings now, which allows homeowners to choose their level of efficiency. The higher the level, the more efficient the unit is. This means less energy is used, which translates to lower running costs. Ducted systems can be enhanced with zoning, where you divide your house into different zones to vary the airflow throughout your home. Through this system, you can choose to turn on the heating for only certain areas or rooms, rather than the whole house. Since you are only using heating when and where you need it, this helps you save on energy bills in the long run. With the main heating unit located on the outside of the home, only the grilles mounted in the ceiling or floor are visible indoors. This means ducted gas heating works well with most interior design and styles, and is not very visually intrusive. The Energy Rating Labelling scheme in Australia is designed to help customers choose energy efficient appliances. The more stars an appliance have, the more efficient it is. And the more efficient it is, the more it can help you save on energy costs. Can you add cooling to ducted heating? Yes. Add-on air conditioning is a good option for those who already have ducted gas heating and are looking for a cooling system. You can find out more about add-on air conditioning. How long does it take to install ducted gas systems? Installation generally does not take more than a day in good weather conditions. For a more specific timeline, please contact our team. Rinnai is a trusted leader in hot water, heating and cooling solutions, providing reliable and high quality products. Its products are designed with the environment in mind, with low emission technology and high efficiencies as well as other great features. And don't be worried about the mess! We will tidy up your house after the installation, removing all rubbish and any old systems we were replacing. We also understand how important it is to have a peace of mind and warranty with a new heating system, so we supply all the paperwork from the manufacturer as well as from Dale Air. We service all Vic metro areas, and specialise in Melbourne suburbs including but not limited to Brighton, Sandringham, Cheltenham and Mornington. For more information, contact us today at 1300 301 665, or email info@daleair.com.au. We guarantee a 24-hour response time to any online enquiry that we receive.